Some young users are experimenting with different ways to vape, modifying their e-cigarettes to increase the smoke and the high—and raising more concerns about the health harms of this hot pastime. 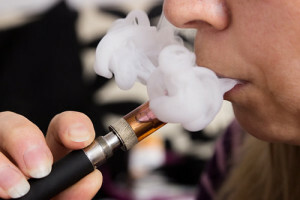 Researchers say they found that a quarter of the 1,800 or so of the youthful vapers they studied engaged in a practice dubbed “dripping.” They altered their e-cigarettes to expose the normally sealed heating element, and then they poured flavored vaping liquids directly on it. That created a bigger puff of smoke, which, when inhaled, produced a more intense high from the blast of nicotine and other chemicals vaporized from the flavored liquids. This practice also potentially exposes them more to addictive nicotine and cancer-causing substances, especially byproducts that result from high-heat vaporizing of the flavored liquids, the researchers reported in their study, published in the medical journal Pediatrics. Users also said they preferred dripping because it let them switch flavors more quickly and easily, rather than pouring the specialized, packaged liquids into a sealed e-cigarette unit. But experts noted dripping likely exposes the users in this way to higher doses of nicotine because they often spilled the flavored liquid on their skin, where it gets absorbed swiftly. With the rise in popularity of vaping, proponents have claimed that e-cigarettes are a safer recreational alternatives than cigarettes, and that nicotine may not be as harmful as anti-smoking foes say. The former point is disputed and controversial, and the latter is not evidence based. Research has affirmed nicotine’s detrimental, addictive effects throughout the body, where, as an irritant and inflammation cause, it continues to be linked to various cancers. A separate, small, new UCLA study, as reported in JAMA Cardiology, has found that habitual vapers also may wish to reconsider their e-cigarette puffing because it raises their cardiovascular risk. Vaping remains a public health concern, of course, because research increasingly suggests that e-cigarettes’ use leads teens, especially, to smoking “real” cigarettes. Yet another study, based on 347 high school seniors surveyed twice in year and published in the medical journal Tobacco Control, finds vaping to be a “one-way bridge” for kids to become cigarette smokers. High school seniors who did not smoke before but vaped were more than four times as likely to take up smoking within a year as peers who neither used e-cigarettes nor regular cigarettes, the study found. High schoolers who hit the senior year as nonsmokers but were recent vapers also were more likely to have become cigarette smokers when asked in follow-up surveys a year later. I’ve written about the terrible health harms that smoking, yes, and vaping cause. And Big Tobacco’s well-documented role, past and present, in contributing to so many Americans’ death and suffering due to smoking and vaping is simply shameful. We need to do what we can to keep Americans young and old from starting to vape or smoke and to help them quit.